I created this guide to help you understand what is in the dangerous kitchen household chemicals likely stockpiled under your kitchen sink and elsewhere. I'll also help you identify and correct other potential kitchen hazards, and explain how they may affect the overall environmental health and safety of your entire home. From Teflon Flu - to hidden Toxic Black Mold and Bispenol-A. From Carbon Monoxide - to opportunistic scavenging kitchen critters that may trigger Asthma attacks. Your kitchen is a good area to look for ways to create a more healthy home. Below are many tips to get you started. If your kitchen is like mine, it is probably often a beehive of activity. And those daily activities can quickly affect the air quality throughout your entire home. There is probably frequent cooking, and there may also be combustion of fuel gases. Often there is steam, smoke, and complex toxic organic gases produced. There may also be a sizable inventory of dangerous household chemical products - such as pesticides, poisons, and strong acids - and they are likely being stored within feet of food and beverages. Some of these fragrance-filled household hazardous products stored in kitchen cabinets may even smell like candy or fruit juice to a child. And many are also in colorful containers that resemble those of food or beverage items too. Hopefully these potential human poisons are completely out of the reach of children, because thousands of kids are poisoned every year when child-proof containers, latches and locks are not used to limit access to chemical storage areas and containers scattered throughout most homes. Check to be sure kitchen range hoods are being used during cooking and that the vent duct is NOT venting into attics or living spaces, otherwise mold growth may become more likely in those areas. Exhaust venting is particularly important for gas stoves because of the danger of Carbon Monoxide Poisoning. See below sections for more information about CO gas hazards. Cover pots and pans while cooking food in order to help reduce steam escaping into your home (less humidity helps reduce mold, mildew, and dust mites). Covered cooking also means faster cooking, so often this will save energy too. Look for and correct wet conditions that may cause mold. Inspect frequently for any signs of water leaks or condensation under and around water pipes, drain pipes, sinks, faucets, garbage disposals, dishwasher, vent ducts, windows, and refrigerators and freezers (lines, drip pans, door seals). Just before leaving for vacation consider shutting off water valves to kitchen or laundry appliance supply lines to prevent possible rupture while you are away. I usually close off the valves to the washing machine at least, but would probably do the same for the refrigerator if I were able to get to it more easily. I know of someone who had a water line to his washing machine break while he was away for weeks. It caused thousands of dollars in water damage and a severe mold problem in several levels of the home. Not good at all. His misfortune made me a lot more aware of how important it is to avoid water damage and possible mold growth. Even small water leaks, given enough time, can do a lot of damage and contribute to indoor allergies. Burning and Frying greasy foods can produce persistent indoor air pollution and produce a sticky residue on objects throughout the home. Be sure to ventilate the house if smoke and odor becomes a problem while cooking. More than just being unpleasant, such air pollutants as Polycyclic Aromatic Hydrocarbons may be released and create very poor indoor air quality for an extended period in air-tight homes. These tiny combustion particles and gases may also increase the risk of diseases such as cancer and lung disease. Reduced life-expectancy due to indoor cooking fire pollution is a major air quality problem in poorer areas of some third world countries, such as in India, where the cultural norm is kitchens with improperly ventilated open fires fueled by wood or dung. Be aware that there is growing evidence that Non-stick Teflon pots and pans may produce very toxic particles and fumes while being pre-heated or during cooking. Inhalation of these Teflon fumes have been correlated to possible flu-like symptoms (referred to as "Teflon Flu"), and this Teflon poison has also killed many pet birds, such as African Grey parrots. Potentially deadly Carbon Monoxide Gas is a particular danger in kitchens with gas stoves. Be sure combustion equipment is properly installed, used, and maintained. Gas appliances should be regularly inspected by a professional who has the equipment to find gas leaks or to detect improper combustion which can lead to Carbon Monoxide hazards in the home. Exhaust from gas stoves and other fuel powered equipment should be vented to the outside of the home. Also, be sure your home has properly installed functional Carbon Monoxide detectors in the proper locations. For more information, see the below section on Carbon Monoxide Gas safety. Avoid exposure to Cockroach allergens, which results from Roach feces and degraded body parts. This can become a serious indoor air problem, especially for children with Asthma or people with respiratory conditions. Cockroach allergies are particularly prevalent in low income urban housing developments and unsanitary living environments where garbage and food wastes sustain significant Roach infestations. Avoid Cockroach infestations by cleaning up all food spills immdediately. Remove and discard garbage bags regularly and keep temporary garbage storage areas free of trash and bits of food waste. Never leave dirty dishes/pots/pans out overnight. Keep food in air-tight containers. 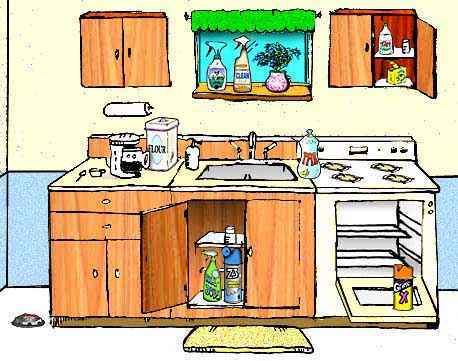 Clean the kitchen and other areas regularly. Basically don't make it easy for Roaches to find food in or around your home. If you do have to hire an exterminator, ask what chemicals will be used and do thorough research to understand the possible hazards of the pesticides used. It is best to avoid all pesticide use. I stopped using most household chemicals, pesticides in particular, decades ago. However, if you do use pesticides, be very aware of the potential for food and beverages to become contaminated by airborne droplets, vapors, or surface residues in or around your kitchen during or after treatment. Remove any objects or small appliances that may become contaminated with any amount of the pesticide and then later come into direct contact with food, such as food storage containers, toasters, or dishes. Remove all food and drink items before pesticides are applied, and be aware that these chemicals can persist for a long time inside and may also cause irritation of the eyes, nose, and throat; plus increased cancer risk, or neurological / organ damage, especially in the very young. Below is a section with more information about what is in Roach Killer. Keep pesticides and other chemical products out of reach of children and follow the use, storage, and disposal instructions very closely. Opt for eco-friendly exterminators that specialize in chemical-free pest control (or chemical-free "Integrated Pest Management"), or who use more "inert" chemicals proven to be less toxic to humans and pets. Almost all exterminators will claim their products are "non-toxic" to humans, but many are lying or are unaware of the true hazards of what they use. You really have to do your research to know who you are dealing with. More on that coming soon. Many kitchen household chemical products, such as those covered in the chemical product section below, tend to emit dangerous gases known as Volatile Organic Compounds or VOCs - which are a major cause of indoor air pollution and Sick Building Syndrome. This toxic gas release, or "off-gasing", is usually highest during and immediately after use, but the gases may still slowly escape from areas of application, or from the containers even while in storage. Eliminate as many of the below toxic kitchen household chemicals as possible, and replace those remaining with low or no-VOC alternatives. Either way, try to remove all chemicals from living spaces, especially the kitchen, if possible. There are other sources of VOC in your home that can not feasibly be removed because they are part of the building's structure. Examples are presswood products, oriented strand board (OSB), plywood, laminates, adhesives in building materials, and some types of flooring such as carpeting or foam pads. See the last tip about having your home air tested for these most common and very health damaging of indoor air toxins. NEVER mix household chemicals because dangerous chemical reactions may result or toxic gases may be relesed into the air. Examples are potentially deadly Chloramine and Chlorine gas which may be release when Chlorine Bleach is combined with acidic products such as Drain Cleaners, vinegar, or ammonia. NEVER pour chemicals down the drains to dispose of them! This is often illegal, regardless of whether your wastewater goes into a residential septic system or a city sewer system. Not only can this destroy the natural microbial activity needed for healthy septic tank waste decomposition, but it is dangerous and irresponsible due to the above described potential for chemical reactions, toxin releases, and environmental damage such as groundwater pollution. Be sure the rooms and hallways of your home, especially near the kitchen area, has Smoke Detectors in good working order. But do be aware that some Smoke Detectors contain a small amount of a radioactive element known as Americium - see the below section on Smoke Detector Safety to learn more about this potential source of radiation. A properly classed kitchen fire-extinguisher (one that will work on grease fires) is also a must-have. Be sure to check the extinguisher gauge periodically to be sure it is still fully charged and ready for use, and make sure all occupants know where to find and how to use the extinguisher. Mount or place extinguishers where they can be easily seen and accessed. Got GFI Outlets to Reduce Electrocution Hazards? To reduce the risk of electrocution where electrical outlets are located next to water sources in the kitchen or other rooms of your home, check to be sure Ground Fault Interrupt (GFI) outlets have been installed. These are special circuits that will trip to immediately cut of the power to the outlet upon being shorted out, such as in the event of exposure to water. Sockets are required to be GFI outlets if they happen to be located within a certain distance of water sources such as faucets or in outside areas like a porch where rain and other water sources could be an issue. GFI outlets are a legal requirement to comply with building codes in most areas. In case you are wondering which of your outlets may already be GFI - look for those which may have a test button near the sockets. In my home this indicates they are GFI, but in your home they may appear differently. If in doubt, consult with an electrician to see if your dwelling meets electrical building code standards of safety. There is growing concern over health damaging toxins leaching into foods and beverages from plastic packaging and storage containers. Bisphenol-A is one such plastic-derived toxin that is now being detected in most everyone's bloodstream and which has some serious health implications such as increased risk of cancer. Learn what my family is doing to avoid Bisphenol-A and why maybe you should also start to eliminate plastics from your kitchen too. You can also learn more about the types of plastics in the section below. If you would like to know how many indoor chemicals you may be breathing and where they are coming from - or if you would like to find out if your kitchen or other rooms may harbor hidden mold colonies, for example - behind walls, under / inside appliances, in ceilings, or in sub-flooring - I recommend you test your indoor air for hidden mold + over 400 chemicals simultaneously. An accurate home air test is the best way to quantify and find the sources of indoor air pollution in your kitchen or any other rooms in or around your home. How Many of These 16 Common Kitchen Household Chemicals and Hazardous Waste Sources Are You Stockpiling? The ingredients in all-purpose cleaners are a combination of detergents, grease cutting agents, and possibly solvents and disinfectants. These products may contain one or more of the following hazardous ingredients: Ammonia, ethylene glycol monobutyl acetate, sodium hypochlorite, and trisodium phosphate. Depending upon the ingredients contained in the particular cleaner, they can be mildly to extremely irritating to the skin, eyes, nose, and throat, and corrosive if swallowed. Chronic irritation may occur from repeated use. I can attest to the extreme dangers of Hydrofluoric Acid because we use it on a daily basis in our Inorganic labs. Hydrofluoric Acid and Fluoboric or Fluoroboric Acid are some of the few acids which will dissolve the silica and alumina based chemical catalysts we analyze. We take special precautions when using Hydrofluoric Acid because unlike the other acids we use, if enough Hydrofluoric Acid contacts the skin it can be deadly! Many have died from relatively small skin surface area exposure to Hydrofluoric Acid. It's an extremely painful way to die! Throughout our labs we have easily accessible vials of Calcium Gluconate which is a cream to be immediately applied upon any skin contact with Hydrofluoric Acid. Calcium Gluconate quenches the reaction of Hydrofluoric Acid with the body's calcium. It's an essential item to have around when using Hydrofluoric Acid because if exposure to Hydrofluoric Acid occurs a pernicious chain reaction ensues which affects tissue and blood eventually resulting in severe damage and likely death. Because our labs use this deadly acid on a daily basis we have notified the authorities so they can be prepared in the event of an emergency due to Hydrofluoric Acid exposure. The local emergency response teams, our own first responder emergency management teams, and the local hospitals have all been equipped with special injectable antidotes and the Calcium Gluconate cream which counteract the effects of Hydrofluoric Acid exposure. STAY AWAY FROM HYDROFLUORIC ACID, IT'S A KILLER! Go to our Complete Guide to Asbestos for complete information about Asbestos, including: extensive MSDS information, list of specific product brands with Asbestos, jobs, symptoms, and case studies of asbestos exposure. If you encounter asbestos or suspect asbestos hazards in your home these asbestos tips for homeowners may also help. Alternatives: For household disinfecting, borax is an option. For bleaching clothes, oxygen (dry) bleaches work well. If you are sold on chlorine bleach, reduce the amount of liquid bleach used in your wash. Carbon monoxide is a colorless gas which is practically odorless, tasteless, and non-irritating - yet it can quickly kill you. Many deaths and serious health damage results every year from Carbon Monoxide Poisoning. Carbon Monoxide Detectors installed in rooms and hallways have save the lives of many homeowners in situations where the gas built up inside with little warning besides the alarm sounding. Carbon monoxide is always formed when a fuel containing carbon is inadequately burned with poor ventilation. Kerosene, charcoal, coal, wood stoves, and automobile exhaust fumes are common sources of carbon monoxide poisoning. Natural gas or Propane in the United States does not contain carbon monoxide, but it may form if the gas is burned without adequate air supplies. Carbon monoxide starves the body and brain of oxygen. Carbon monoxide poisoning produces symptoms ranging from headache, dizziness, flushed skin, disorientation, troubled thinking, abnormal reflexes, shortness of breath, fainting, and convulsions, to coma and even death. Heart problems are also aggravated by the presence of carbon monoxide because the heart must pump harder. Children, persons with respiratory illness or anemia, and the aged may be particularly sensitive. Chronic exposure to low carbon monoxide levels impairs judgement and increases the time required to make decisions. In your kitchen a possible source of Carbon Monoxide gas emmissions is your electric stove when set on the self-cleaning mode. This mode super heats the interior turning spills, grease, or food particles into gases such as carbon dioxide and possibly carbon monoxide which may vent into the room if the stove is not vented to the outside. Be sure to read instructions for safe operation of your gas or electric stove, especially during use of the self-cleaning setting. Gas stoves are more prone to producing Carbon Monoxide because no matter what mode, the stove is burning a carbon-containing fuel for heat. If you have an attached garage, always make sure the door to the house is closed and the garage door is open when the car is running. During snowy or icy weather, before starting engines of vehicles, always check to be sure exhaust pipes of vehicles have not become plugged or blocked with snow or ice. Starting the engine with blocked exhaust may result in the Carbon Monoxide poisoning for those inside the vehicle. Always beware of situations where a vehicle is running in a confined space, snowed in or otherwise. NEVER operate combustion equipment such as gasoline powered generators inside garages...EVEN IF THE DOOR IS UP. Many Carbon Monoxide deaths and Carbon Monoxide Poisonings have occured during hurricanes and storm power-outages when people ran fuel-powered generators in attached garages where Carbon Monoxide built up. Precautions should be taken when operating gas grills or any other type of combustion appliance or device used in or adjacent to garages or other confined spaces where gases may build up. If you think that you have a problem with carbon monoxide fumes, contact your local or state Department of Health for assistance. All detergents contain "cationic," "anionic," or "non-ionic" detergents. Cationic detergents are the most toxic when taken internally. Symptoms from ingestion include nausea, vomiting, shock, convulsions, and coma as quickly as one to four hours after ingestion, due to rapid absorption. By themselves, anionic detergents have low toxicity causing mild, local irritation of skin and eyes. But the addition of "builders" to anionic detergents is common and makes anionic detergents alkaline and caustic. Non-ionic detergents have low toxicity. At most, mild irritation of the skin and mucous membranes occurs. Ingestion causes no hazardous effects. Some typical nonionic detergents are alkyl aryl polyether sulfates, alcohol sulfonates, alkyl phenol polyglycol Ethers, and polyethylene glycol alkyl aryl ethers. Plastics are materials with a high degree of utility and many safe household uses. They can take the place of other materials that may have more harmful relative impacts. Some plastics, however, are associated with dangers in the manufacturing process, when misused and on other occasions: over their entire life-cycle from manufacture to ultimate disposal. They also comprise a significant fraction o f the entire municipal waste stream. For these reasons the principals of source reduction, reuse and recycling are just as valid for plastics as for other waste products (see Reasonable Responses below). BEWARE #7! Polycarbonate - This type plastic may contain the suspected endocrine disruptor and carcinogen know as Bisphenol-A. In 1995 the CDC found that Bisphenol-A is likely found in 95% of Americans' blood. This is particularly alarming since evidence is mounting in support of the theory that Bisphenol-A is a possible contributor to the rise in Prostate cancer and other health issues over the last decade. Some examples of products made with polycarbonate plastics are milk containers, water bottles, baby bottles, pacifiers, sippy cups, toys, can liners, food storage containers, dental sealants, plastic eating utensils, and water pipes. No wonder Bisphenol-A is such a common blood contaminant in Americans and why California has already banned many products which may potentially release Bisphenol-A. Smoke detectors are important for early detection of fires. There are two types of smoke detectors: photoelectric, which detects only visible products of combustion, and ionizing, which detects both the visible and invisible products of combustion. Ionizing (or ion chamber) smoke detectors contain a very small amount of radioactive material, Americium-241 (Am-241). Am-241 has a half life of 458 years and emits alpha particles, a lower energy form of radiation. The ionizing smoke detector is constructed so that to gain access to the radioactive sections would require the complete destruction of the smoke detector, which ofcourse is NOT a good idea because even alpha particles are radiation which can be harmful. The best way to dispose of an ionizing smoke detector is to return it to the manufacturer. The photoelectric smoke detector can be disposed of in the trash. The best solution for controlling indoor air pollution that may result from the above kitchen household chemicals and hazards is source control and elimination wherever possible. Substitution is also a good strategy especially given the growing popularity and variety of green cleaners and non-toxic products. For what you can not eliminate or control, such as the carcinogenic Formaldehyde Gas being steadily released from the particle board in your kitchen cabinets or counter tops (among other sources), you can utilized an air purification system including room air cleaners that contain special gas-phase filtration media. Cheaper HEPA air purifiers will not help much at all for most of the gaseous kitchen hazards like Volatile Oraganic Compounds, tiny smoke particles, cooking fumes, odors, or Teflon gases. HEPA filters capture solids such as fine dust particles, but health harming gases pass right through. The top room air cleaners include powerful fans, tight seals, solid design, HyperHEPA particulate filtration, independently certified performance, AND substantial amounts of gas filtering materials like Activated Carbon and Potassium Permanganate. These gas absorbing materials efficiently grab onto and hold VOC molecules as they cycle through the gas capturing filters. This type of all-in-one air purifier can do wonders for controlling any residual pollutants from your kitchen and adjacent areas. But again, source control and elimination is the best tasting low-hanging fruit in the kitchen.